In a large bowl, whisk together the flour, baking powder, salt, and 2 cups of the sugar. In another bowl, whisk together the eggs, vegetable oil, apple juice, and vanilla. Add the wet ingredients to the dry ingredients and stir to combine, mixing well. In a third, small bowl, whisk together the remaining 5 tablespoons of sugar and the cinnamon. Pour half the cake batter into the prepared pan. Put the sliced apples on the batter and top with the cinnamon and sugar mixture. Pour the remaining batter on top of the apples. Bake in the preheated oven until a toothpick inserted in the center of the cake comes out clean, 70 to 90 minutes. You can vary the cake in several ways. Make a basic glaze from powdered sugar, egg white, and vanilla extract for a plain icing and drizzle it over the cake. Add 1/2 cup chopped walnuts to the apples. Add a little orange or lemon zest to the apples. Add 1/4 teaspoon of ground ginger or nutmeg to the cinnamon. Replace the white sugar in the cinnamon mixture with 5 tablespoons of brown sugar. Add 1/4 cup raisins to the apple mixture. 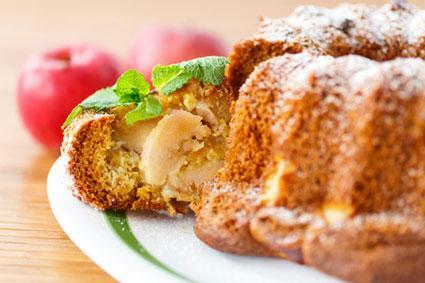 Apple cake is popular in a number of cuisines. For example, Polish apple cake, also known as Szarlotka, is actually a pastry made from short crust pastry and apples. Another popular type, Jewish apple cake, is a popular Hanukah dessert that doesn't have any dairy in it so it meets Jewish dietary laws about not mixing meat and dairy products. Add an apple cake recipe to your dessert repertoire.